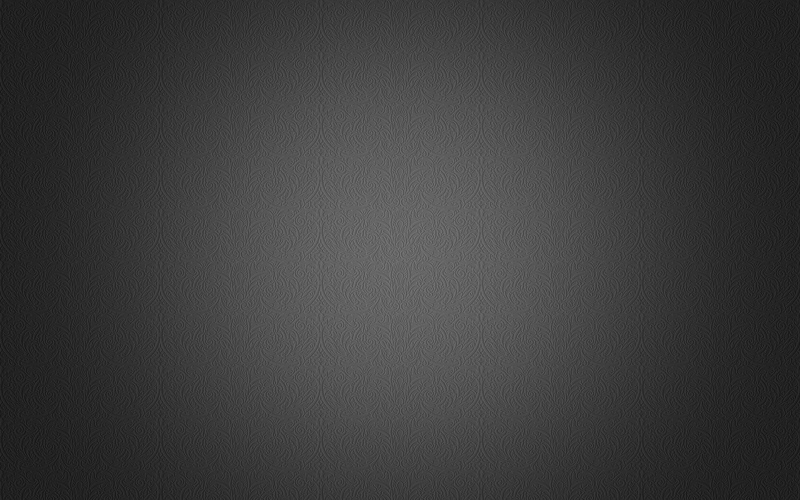 THE NEWEST UPDATES YOU CAN FIND HERE! Kangasvuokon Leonore is now Belgium Beauty Champion and has covered the requirements for INTERNATIONAL CHAMPION! Smooth collie Kangasvuokon Leonore won CAC and CACIB at EURODOG SHOW Belgium! Nora has already one Youth Champion title and one full National Champion title. Also already agility exam and socialisation test! We are very proud with her successes! Our dogs were presented at the EUROPEAN DOG SHOW 2016 (Brussels) with exelent results! 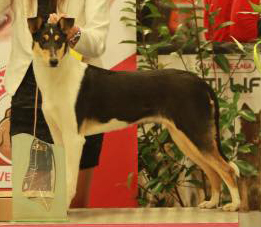 SMOOTH collie Kangasvuokon Leonore won 3d place in "Youth" class in very strong competition! 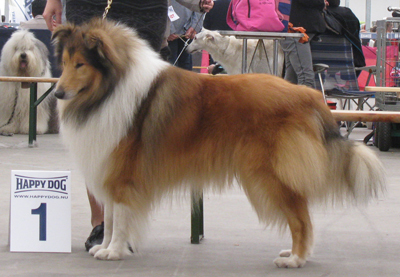 ROUGH collies: One For All Athos Angel Silvestre & Only Porthos Angel Silvestre were presented in Youth class as wel! One Happy Boy Angel Silvestre was presented in Intermedia class and won 1st place!!! Congrats to his owner Paulina from The Nederlands! After few great presentations on dog shows in Belgium some of our dogs has covered the requirements for CHAMPION OF BELGIUM as follows: Riverside Song Waltzing Matilda and Ricks Machagony! Bucky is also INTERNATIONAL CHAMPION! And not to forget our newest hope, SMOOTH COLLIE - KANGASVUOKON LEONORE (Nora) who has covered requirements for Youth BELGIUM CHAMPUION!!! We have new imports! For more info see "Ourdogs"
Kangasvuokon Leonore (smooth collie) won R.BIS on the International Dog Show in Turnhout! 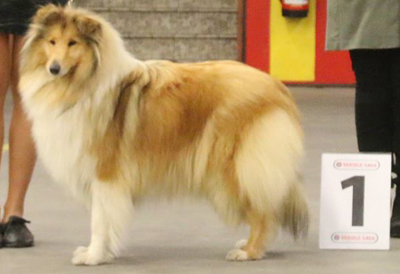 Ch.Riverside Song Waltzing Matilda won CAC,CACIB and BOB on the International Dog Show in Turnhout, Belgium! Judge: Hastings Rose from Ireland! Ch.Ricks Machagony won twice in a roll on International Dog Shows in Belgium and The Nederlands with CAC, CACIB and BOS and covers the requirements for INTERNATIONAL CHAMPION!!! Arwen & Lucy are now both CHAMPIONS and Crufts qualified!!! Good results from the 2 International dog shows in Croatia 16-17.05.2015. Lucy won 2xCAC,CACIB! Arwen - CAC! 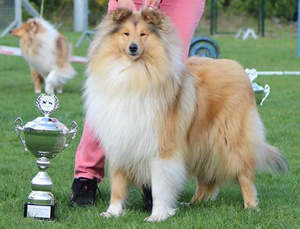 Great results of Angel Silvestre doggies on the Collie Association club show in Belgium! In very big "Baby" class Oria Angel Silvestre & Orlanda Luna Angel Silvestre got both Very Promissing! In also big "Junior" class females Riverside Song Victory Dance got the 3d place with Excellent and in "Intermedia" class Riverside Song Waltzing Matilda won with Excelent and finally CAC! Great results from our dogs on the specialty club shows in Germany 01.05.2015 Nordhorn - Rodt 03.05.2015. Riverside Song Victory Dance won the very big "Open" class with CAC on the first show with Excelent! Riverside Song Waltzing Matilda won the Intermedia class with Excelent, CAC and finally BOB on the first show and Excelent 1, CAC on the second show with Tony Iley. 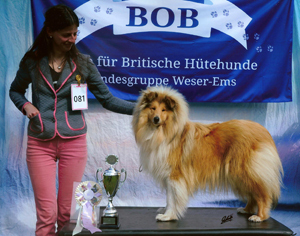 Bucky (Ch Ricks Machagony) won CAC and CACIB on the International dog show in Antwerpen. Thanks to the judge Mis.Skallin! 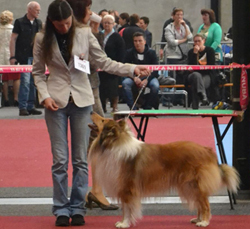 Riverside Song Victory Dance (Arwen) won her second point for Belgium Junior Champion on 19.04.2015. There is one more to go for Arwen. Riverside Song Waltzing Matilda keeps owning the young show ring with winning her class on the dog shows in Eindhoven and Goes. In Antwerpen and also the second show in Goes she got placed second. We have dogs available for co-ownership / Wij hebben honden beschikbaar voor mede-eigenaars! HAYTA AND BUCKY had puppies in FEBRUARY! 10.01.2015 Riverside Song Victory Dance (Arwen) won 1st place with Best Junior of Breed at the LKV dog show in Genk with judge Hatirch Josef from Germany. This was first show for Arwen. On the same dog show Hayta got her permision for breeding in Belgium with Excelent 3d in Open class. 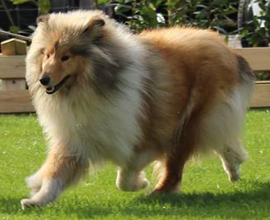 20.12.2014 Riverside Song Waltzing Matilda (Lucy) won 1st place with Excellent, Best Junior of Breed and BEST OF BREED on the Christmas show in Tienen! With this Lucy covers the conditions for Junior Champion of Belgium! 6.12.2014 On the Brussels Dog Show 2014 Lucy (Riverside Song Waltzing Matilda) at 10 months won 1st Excelent, Best Junior of Breed, Crufts qualification for 2015 and BENELUX YOUTH WINNER! Thanks to the judge - Mr.Kotlar from Hungary! 30.11.2014 British sheep dog club show in Belgium Lucy (Riverside Song Waltzing Matilda) won Best junior of breed and BIS Junior 2!!! Ch Ricks Machagony is available for stud! For information, feel free to contact! 21.09.2014 first CAC for Belgium National Champion for Ricks Machagony followed by BOB and Continental Winner! 30.08.2014 first CAC for Luxembourg's Champion for Ricks Machagony! 16-19.07.2014 on the International dog shows in Balchik (BLACK SEA WINNER SHOWS) Ricks Machagony has won his first National Champion title and others: 5xCAC, 5xCACIB, 5xBOB, Bulgarian Champion, Bulgarian Grand Champion, Balkan Champion, Black Sea Winner! 31.05.2014 first CAC for Polish Champion for Ricks Machagony! 24.05.2014 first CAC for Nederlands Champion for Ricks Machagony! 23.02.2014 Jr.Ch.Belg. Ricks Machagony has got the permission to breed from St.Hubertus Belgium. 15.02.2014 Bucky has successfully passed the Therapy Dog exam by Toscanzahoeve! 8.12.2013 Ricks Machagony (Bucky) has succesfully passed the obedience proof with 92/100points! Ricks Machagony became Junior Champion of Belgium 2013!